“My decision to study Law at Bangor was, at best, a pragmatic response to being struck by the sudden realisation that I couldn’t take my first choice”, says Thomas, from Preston. “But Bangor seemed friendly and welcoming when I rang, and I had an interest in Law”. Now, with a 2:1 in Law, Thomas is finally on course to become a doctor. And the academic qualification is not the only thing he’s gained at Bangor. “Bangor has helped me to gain maturity, allowed me to grow emotionally, and given me valuable perspective on the levels of commitment and hard work which I will need to put in not only in my further degree, but also throughout life”, says the 21-year-old. 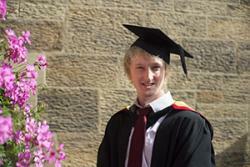 “Looking back on myself three years ago, I feel in a much better position now to make the step forward into Medicine.